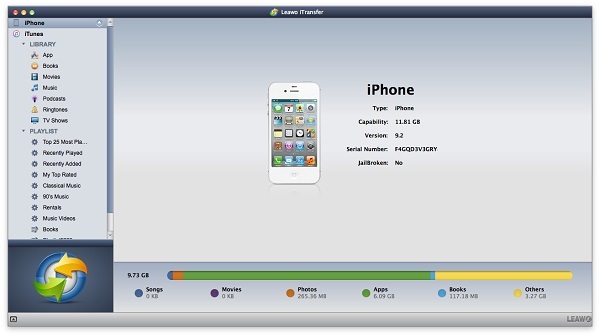 As we all know, iExplorer is a powerful gadget that allows us to transfer different contents between iPhone, iPad, iPod and computers. However, it also has limitations. Hence, today I would like to introduce some iExplorer alternatives Mac for you. Before we deep into iExplorer Mac alternative, we need to clarify what iExplorer Mac is. What is iExplorer Mac? iExplorer Mac is a useful transferring tool that is typical for transferring multiple files like music, messages, contacts, voicemail, notes and other kinds of contents. With a modern and concise interface, iExplorer Mac allows you to directly drag and drop files to iTunes and computers. 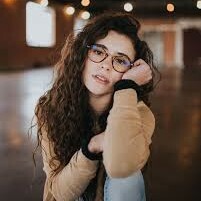 What’s more, you can search for music you like and listen to them here. When you read this, do you feel iExplorer is similar to iTunes? Yes, they are similar but not the same. When you insert your iOS device to computer, iTunes can’t enable you to access to all iOS folders, but iExplorer can even reveal those hidden files. iExplorer has free version and paid version. If you want to enjoy more functions, you need to pay $39.99 at least. Now let’s learn how to transfer data via iExplorer Mac. 1. Launch iExplorer after downloading and installing it and then insert iPhone to Mac via USB cable. You can see iPhone capacity, software version, serial number and phone number on the right interface. In the left sidebar, you can see contents like music library, backup, photos, apps, media, etc. 2. Here I would like to take music as an example to introduce how to transfer data to Mac via iExplorer. Click “Media Library” in the left sidebar and it will take a few seconds to load all iPhone music. In the right interface, you can see a list of songs. Hold “Command” on the keyboard and select songs you want to transfer, then drag and drop them to the target destination folder on Mac. Though iExplorer is really wonderful in handling iOS files transferring to Mac or Windows, it also has some drawbacks. To let your iOS devices files be viewed on Mac, you need to download QuickTime and make disk-mounting framework, which means your Mac storage will become smaller. Hence, I would like to introduce two iExplorer Mac alternatives for you below. 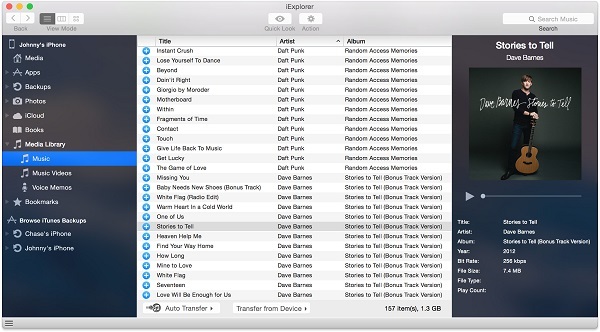 Similar to iExplorer, iTunes also allows users to search, download and listen to music they like. This iExplorer free alternative Mac also gives users access to transferring a wide range of files like apps, e-books, music, books, etc. between iOS devices and computer. However, the drawback of this free alternative to iExplorer Mac is that it can only transfer purchased items. When you want to transfer only a specific category, iTunes will transfer all purchased categories, which is really annoying. For how to transfer data from iOS devices to Mac with this iExplorer alternative Mac freeware, you can learn from the steps below. 1. Make sure you have the latest iTunes on your Mac, then launch this iExplorer free alternative Mac and log into it with your Apple account and password. Afterwards, go to “iTunes > Preference > Devices” and check “Prevent iPods, iPhones and iPads from syncing automatically”. In this way, iTunes won’t automatically sync with your iOS devices and you don’t need to wait all contents syncing, which saves your time and energy. 2. Plug your iPhone to Mac via USB cable, then this iExplorer alternative Mac free will automatically launch. If not, you can open iTunes manually. 3. In the top left corner, click “File” and you can see “Devices”. Mouse over it and choose “Transfer Purchases from iPhone”, then all purchased items from iPhone will be transferred from this iExplorer free alternative Mac to Mac. When it comes to the best iExplorer Mac alternative, Leawo iTransfer for Mac is no doubt the top choice. Its concise and modern interface quickly grabs your attention at the very beginning. 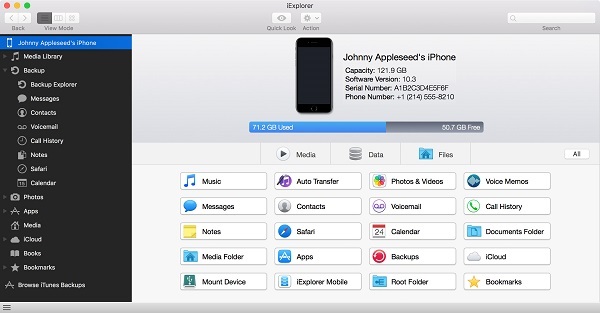 The iExplorer Mac alternative is powerful in transferring all data like apps, music, TV shows, movies, contacts and so forth between iOS devices, iTunes and Mac/Windows computers. Besides, Leawo iTransfer is superior in moving purchased and non-purchased items in an easy and convenient way. The iExplorer Mac alternative has free trial version, but if you want to enjoy more services, you can pay $29.95 for a lifetime use. Now let’s take a look at how to transfer data from iOS devices to Mac with this best iExplorer alternative Mac. Launch Leawo iTransfer after downloading and installing it on Mac and then connect iPhone to Mac. In the left sidebar, you can see various contents like apps, bookmarks, books, camera, contacts, movies, music, etc. You can select any category of content to transfer. For example, you can transfer music from iPhone to Mac by following these steps: go to “iPhone > LIBRARY > Music” and you’ll see a list of on iPhone in the right interface. Choose songs by pressing “Command” on the keyboard, then right click one of selected songs to choose “Transfer to > My Computer”. Or click the transferring icon at the bottom right to activate transferring function in this best iExplorer Mac alternative. A window pops out to ask you to choose a target output folder. Click “Change” in dark blue to choose another folder on Mac. After it is done, start to transfer data to Mac by clicking “Transfer Now” at bottom right corner. Compared with iExplorer, the other two iExplorer alternatives Mac – Leawo iTransfer and iTunes enjoy simpler and easier interface which enables you to easily learn how to use these two tools. 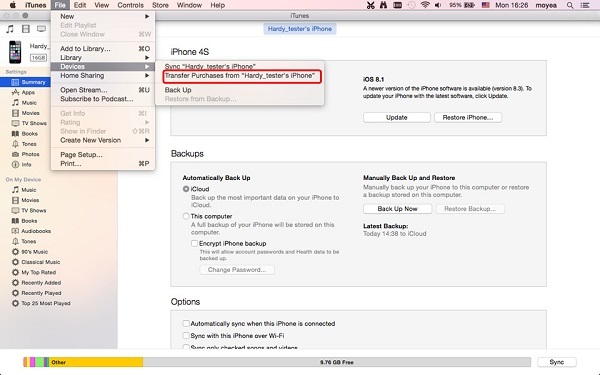 Besides, as long as you connect your iOS device to Mac, you can finish transferring data from iOS device to computer with a few clicks. iTunes enables users to transfer all purchased items from iOS devices to Mac, but if you want to transfer a single category of contents, then this iExplorer alternative Mac free can’t help you. 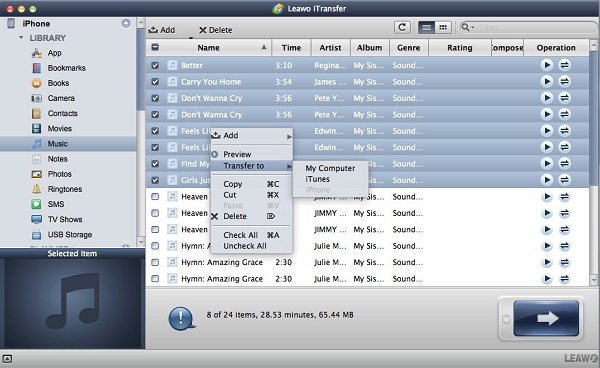 Leawo iTransfer and iExplorer is helpful in transferring different types of contents like contacts, movies, music, etc. from iOS devices to iTunes and computers. 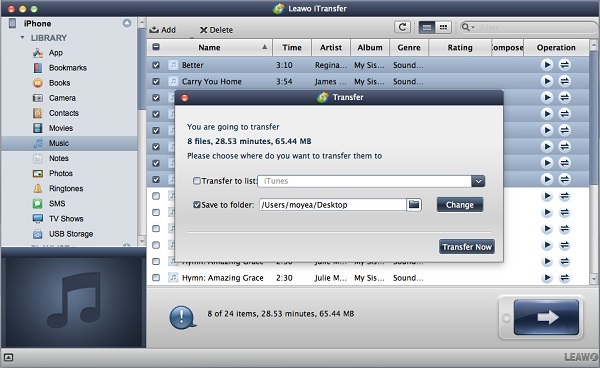 Different from iTunes, Leawo iTransfer and iExplorer give users access to non-purchased items. In other words, you can freely transfer purchased and non-purchased items on these two tools. iTunes is a free alternative to iExplorer Mac, while iExplorer and Leawo iTransfer require users to pay some money so that you can enjoy more services. However, “you get what you pay for”, the powerful functions of Leawo iTransfer and iExplorer deserve you to pay for them.